He was the founding chair of the British Computer Society Information Systems Examination Board (BCS ISEB) of the Software Testing certification board. Educated at the universities of Oxford and Imperial College London, he is a Principal of Gerrard Consulting Limited, Technical Director of TestOpera Limited and is the host of the Assurance Leadership Forum. He wrote “Risk-Based E-Business Testing” with Neil Thompson in 2002 and the “Business Story Pocketbook” with Susan Windsor in 2012. He wrote “The Tester’s Pocketbook” in 2009. He has also written a book on the Python programming language “Lean Python” n 2013 and “Digital Assurnace” in 2016. 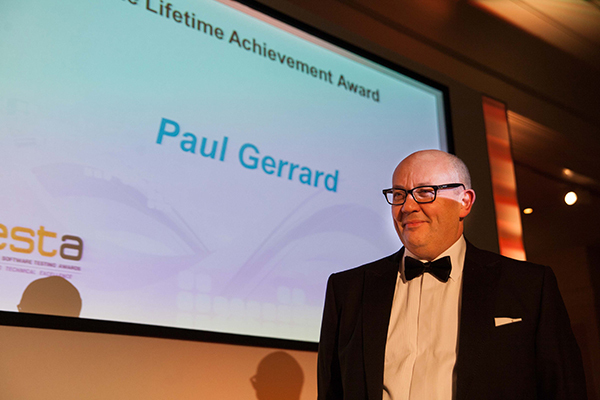 Paul won the EuroSTAR European Testing Excellence award in 2011 and The European Software Testing Awards (TESTA) award for Lifetime Achievement in 2013. He was the Programme Chair for the EuroSTAR 2014 conference in Dublin.